Only two types of eagles are found in Missouri. A small population of bald eagles lives in Missouri year-round, and up to 2,000 more follow the southern migration of geese to Missouri between December and February. A few golden eagles winter in Missouri but spend the majority of their time elsewhere. Eagle viewing events in the Springfield area include an indoor program at the Springfield Conservation Center and Eagle Days in the nearby town of Stella. Eight eagles live year-round in the Stella area, but during the winter that number increases to anywhere from 200 to 400. 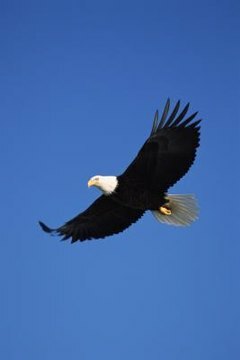 Good eagle viewing is available at the Springfield Boathouse & Marina and the Roaring River State Park near Cassville. Southwest of Branson, you can venture out on your own to view eagles at Table Rock Lake or Shepherd of the Hills Fish Hatchery. Look for birds perched along the water's edge in large trees, and go early in the morning so you can watch them soar and fish. Be sure to take binoculars or a spotting scope with you.